Order your Double Leather Pen Sleeve today from FahrneysPens.com. Fine Pens, Refills & Luxurious Gifts – great prices & fast shipping. 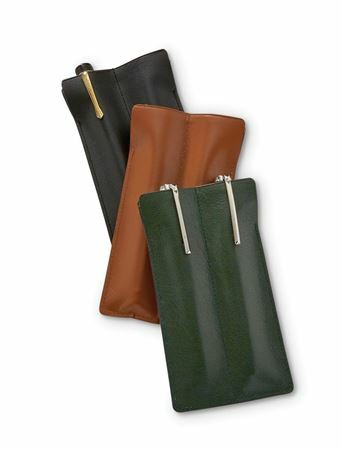 Our slip cases are great for protecting pens in purses, briefcases or pockets. The full-grain cowhide leather is aniline dyed for rich colors in black, tan, dark green, wine or grey. Single case also in orange, red or dark brown. Fully lined to prevent tarnishing. Available in single or new double pen case.